In EEPROM settings you see the Extruder Offset is shown in "steps" instead of "mm". I dont use this feature but its irritating. It is in deed steps. Meanwhile I wished I had used mm but extruder switch works in steps and I thought with int i get no rounding errors when executing the correction. Ok I see. If you actually put some Offset in the Firmware tool and you upload it to your printer it will automatically convert the offset in "mm" to "steps" with the X/Y steps per mm as factor. 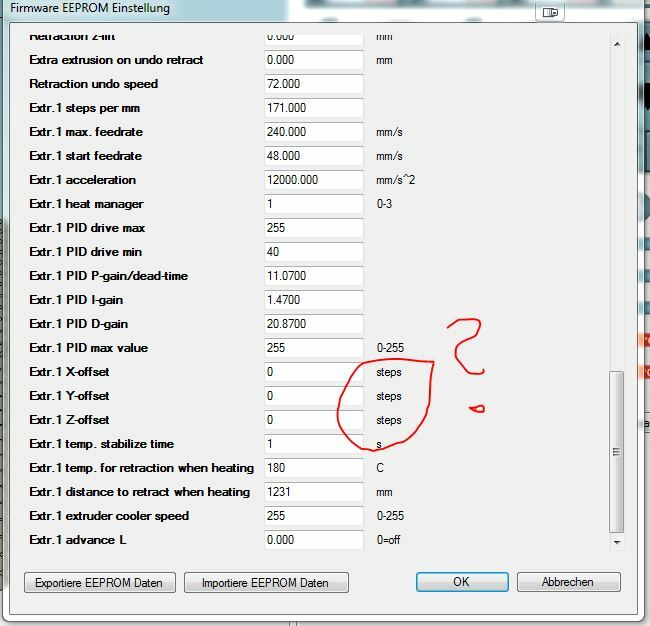 For example you have 160 steps per mm X/Y and you set 20 mm offset it will show 3200 steps offset in "Firmware EEPROM settings" window. Exactly. Conversion is done on eeprom initalization.